Grades 9 to 12 – Is it possible? Imagine you have a pencil, ruler, protractor and compass and you try to draw this triangle. Is it possible? If you have geometry instruments then try it for yourself. What do you notice? 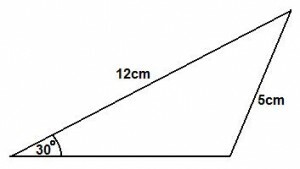 This problem is adapted from the NRICH task Can you explain why? with permission of the University of Cambridge. All rights reserved.